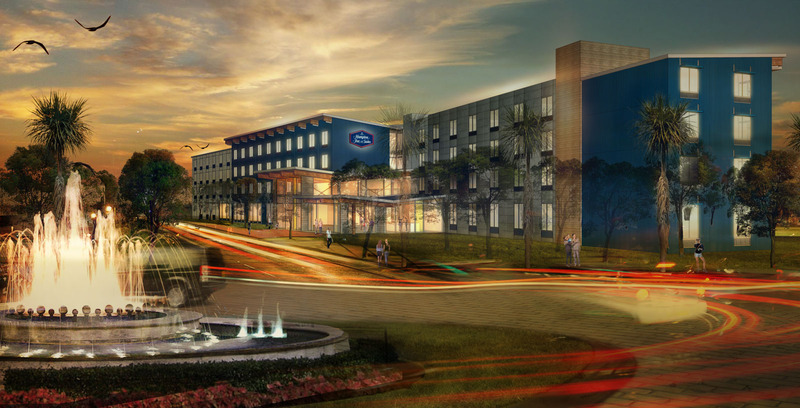 SAN DIEGO - Aug. 4, 2015 - PRLog -- The Corky McMillin Companies and InterMountain Management, LLC are pleased to announce that they are joining efforts to develop a 650-room, three-brand hotel destination at Liberty Station in Point Loma. The new hotels will sit on a 15-acre site that was formerly home to the very successful Wally Park San Diego, an airport park-and-fly company that is ceasing operations after 13 years. Construction for the $150M project will begin in July of 2015, with the first hotel opening in the summer of 2017. Redeveloped by The Corky McMillin Companies and the City of San Diego, the former Naval Training Center, now named Liberty Station, is one of San Diego’s largest and most successful redevelopment projects. The 361-acre community includes parks and open space, shopping villages and restaurants, an arts and cultural district, a golf course, hotels, schools, and homes for nearly 350 families. Liberty Station has become a prime San Diego destination for arts, culture, science and technology. As one of North America’s largest hotel management and development companies, InterMountain Management, LLC specializes in the select-service and extended-stay hotel segments. For over 30 years, InterMountain Management’s dedication to success is proven in the results as a hotel owner, management company and hotel developer. They currently own and/or manage approximately 60 premium branded hotels nationwide. For more information, or to view hotel locations across the U.S., visit their website at www.intermountainhotels.com.